We believe that the quality of your trip will be impacted by many factors; some are within our control and others are not. The selection of our guides is an area where we have control and where we pay very close attention. Our current staff have decades of guiding experience between them and most have been on the Flowers for years. They love what they do and the ultimate goal for them is to have you catch fish, the bigger the better. To this end, my suggestion would be to pay very close attention to their instruction and guidance. They know the lies of the fish, the best flies, the best times of the day, etc. Time and again I hear the guides say that their sport either doesn’t or won’t listen to them, which ultimately leads to frustration for both the guides and for you. Let us introduce them. Born and raised on the banks of the mighty St. Mary’s River, Nova Scotia, Chris has been immersed in the world of fly fishing and the outdoors since he was a child. Watching famed fly fisherman angle for large 3 MSW fish just a short walk from his front door was the driving force behind his fly fishing addiction. Being raised in the country, he learned the way of the woods at a young age, this provided him an excellent segue to becoming a fishing guide. His love of the outdoors got him started guiding for brook trout unprofessionally at the age of 14 on his local rivers and streams of Nova Scotia. He has now been guiding professionally for Brook Trout at Crooks, Minipi and Igloo Lakes since 2016. Chris has been fly fishing since 2008, hooking his first salmon in his second year of angling on the St. Mary’s. Chris is also an esteemed fly tyer, and has been tying at outdoor shows and fishing conclaves across the Maritimes for the past 8 years. Though young, he is a very skilled, intelligent and passionate angler. His love for fly fishing has allowed him to fish for a wide variety of species across the maritime provinces and even competed in the 2012 National Fly Fishing Championships in Mont Tremblant, QC. Chris is completing a Bachelor’s of Science in Environment and Natural Resources, majoring in Wildlife Conservation at the University of New Brunswick. It is no shock that his main interest is fisheries management; he spear-headed a brook trout management plan for a lake in Southern New Brunswick, while at UNB. He wishes to continue his education and become a fisheries manager in the future, but cannot pull himself away from the lure of the Labrador wild. Now that he has fished Nova Scotia’s most famed rivers for salmon and guided for brook trout in Southern Labrador, he is ready to cut his teeth salmon guiding. We welcome Chris for his first year with us at Flower’s River Lodge. Guiding has become a passion and way of life for this young man, and we are very pleased to have him. Born in St. John’s, on the Avalon Peninsula of Newfoundland, Chris picked up fly fishing at a young age. When Chris was 12 his brother brought him salmon fishing on the locally popular Salmonier river. Although Chris didn’t hook any salmon on that trip, he watched his brother playing a large salmon and saw the fish leaping through the air; and was hooked ever since. Chris has fished extensively for brown trout, brook trout, Atlantic salmon, steelhead, and pacific salmon. He is a fly fishing purist and enjoys experimenting with shooting heads and trying new fly-lines. Chris picked up spey-casting around 5 years ago and ever since has spent the first two weeks of every season on the West coast on large rivers in search of large Atlantic salmon. 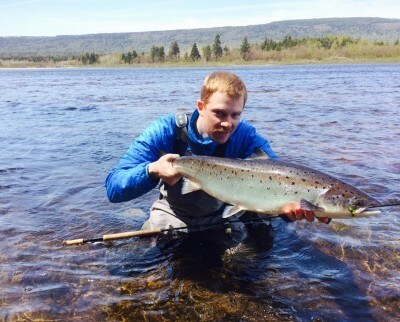 Guiding is a passion of Chris and he started up the Salmonier guide company two years ago, specializing in brown trout and Atlantic salmon on the Avalon peninsula of Newfoundland. The Salmonier guide company is one of the pioneers of saltwater fly fishing on the East coast of Newfoundland; discovering how to target sea-run brown trout when they are at sea during the cold Winters and humid, hot Summers. 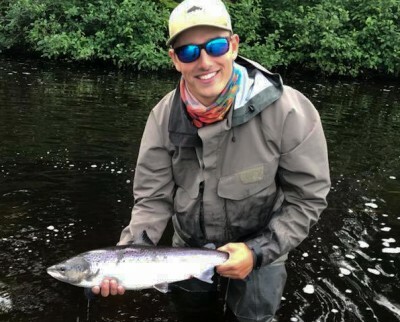 Chris is also a Master’s student in geography at Memorial University of Newfoundland and he is nearly completed his thesis which examines the impact that commercial open-pen salmon aquaculture operations are having on recreational salmon anglers. He has worked with local salmon conservation groups and a first nations band to investigate this topic. 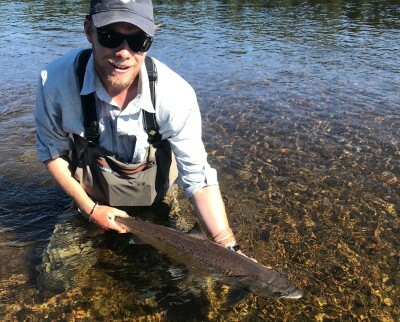 This is Chris’s first year guiding at Flower’s river lodge and the only thing rivalling his experience is his enthusiasm for the fish and the sport of fly fishing. Born and raised in Buchan’s NL., Terry had an intense love of the outdoors and in particular fishing since he can remember. He credits his father with teaching him so many things about fishing and understanding fish behaviour. 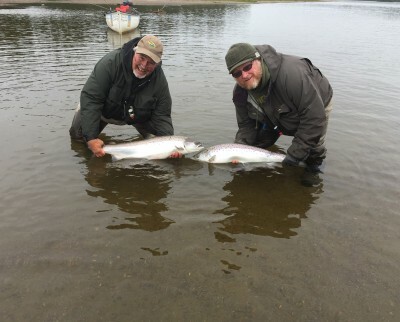 Terry has fished for Atlantic salmon longer than he can remember and is widely known as one of the best that there is. His casting ability is unbelievable and I make sure to give him the rod a few times a day, just so that I can watch his work. He cut his teeth at Big Falls on the upper Humber River and has been a guide since 1986. He guided for years on the lower Humber river for large Atlantic salmon, many of them in the 20-40 pound class. 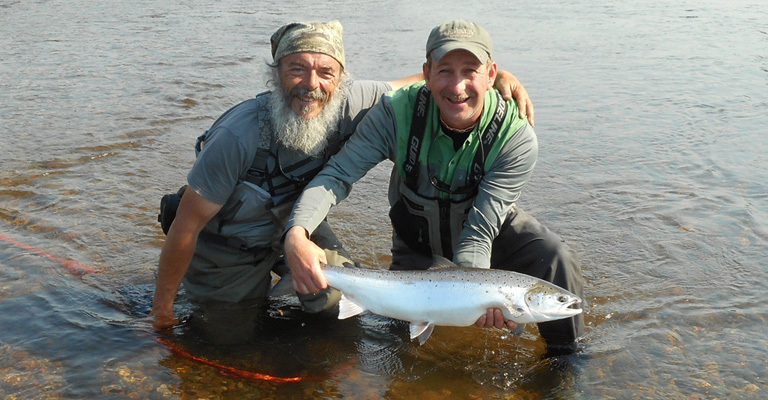 Terry loves fishing and helping people fulfill their Atlantic salmon dreams. He is also an ardent supporter of proper catch and release techniques. Affectionately known to us as “Brutha D”, it seems that in one way shape or form, Daryl has been with us forever. Although Daryl is officially a resident of St. John’s, he hasn’t seen his home there from the beginning to the end of the salmon season, for as long as I’ve known him. Starting on June 1, you will find him roaming his beloved rivers of Bay St. George. He will migrate up the Northern Peninsula and eventually to Labrador as the season progresses. He has an uncanny sense of knowing what a salmon will take and how to present it. He is a world class fly tier in both hair wing and feather wing categories, a great teacher, a patient listener and just a great person with which to spend your time. James was born in Deer Lake, Newfoundland, home of the mighty Humber River. At age 5, his parents presented him with a tube casing, that contained a small 7 ½ ft fly rod, with a tiny reel. With the new rod in hand, James and his father were off to explore Main River, where the beginning of his insatiable desire to spend every waking moment on a river chasing Atlantic Salmon began. It was not until two years later, at age 7, that he managed to land his first Atlantic Salmon. His father and two friends, eventually built a cabin, on what became his favourite river, the River of Ponds . By this stage and at 11 years old, he found himself hiking the river from sunrise to sunset, nearly every weekend. This is where he truly gained his fishing knowledge and outdoor experience. James left Newfoundland at age 13, to attend school in Halifax, Nova Scotia, and is currently finishing his Economics Degree at Queens’ University. 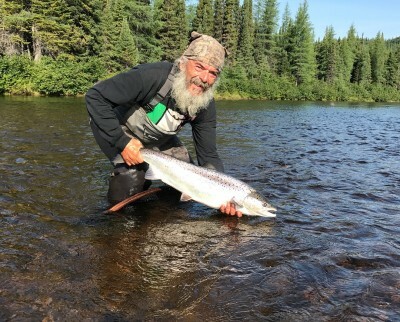 His love of Atlantic Salmon fishing found him returning to Newfoundland to spend his summers fly fishing and this will be his 6th summer guiding in Labrador. His main focus has been on Atlantic Salmon. His future plan is to have a career in the film and outdoor industry, however, many years of exploring, living outdoors and pursuing his love for various outdoor activities, is currently his main focus.